Last week, I was the host for my book club’s monthly meeting. I really like the set up we have: each month, one member is the “host.” This means they pick the book, hosts the event at their place, and provides all the food and drinks. If someone feels they don’t have enough room for all the ladies, another member can offer up their home, but the “host” still provides the food and libations. I’m a huge fan of this kind of reciprocal hosting set up because I often find it stressful when I’m heading over to a friends house for a party or casual occasion and I have to contemplate what I’m supposed to bring. I always more than happy to provide snacks or wine or whatever, but I’m a planner. I like to plan ahead. Plan out the menu. Picking up a random bottle of wine on the way to someone’s place feels a bit lackluster. The point is, I was excited to host all the lovely ladies in my book club for an evening of food and conversation. I had extra time to plan this gathering because it was actually supposed to be a week earlier but we postponed due to the snow and freezing rain. The extra time was key, because I ended up being happy with the food I made. I don’t mean to sound braggy at all, because quite often, despite my best efforts to plan out a menu, the food I serve guests is a big flop. Last time I hosted book club I think all I served was a red pepper dip and everyone left hungry I’m sure. Another one of my blunders is that I misjudge what my guests will want to eat; just a few weeks ago I thought about making a raw kale salad for a dinner party. Luckily my husband kindly guided me away from that plan. Long story short, if you’re hosting a book club or any other dinner gathering, I highly recommend the recipes below! And if you don’t belong to a book club, you should create one. They’re really great. I added extra chard (the whole bunch I bought, I didn’t measure) and an extra 4 ounces of pasta. I also didn’t parboil the chard, but instead I finely chopped it before washing and then added it to the cheese sauce as the same time as the pasta. This caused it to wilt slightly and mix well throughout the whole dish. I didn’t make any changes to the cheese sauce, but it still ended up cheesy enough! I stumbled upon this balsamic vinaigrette recipe a few months ago, and it’s quickly become a staple in my fridge. It comes together so easily and stores beautifully in a jar in the fridge. These took work. 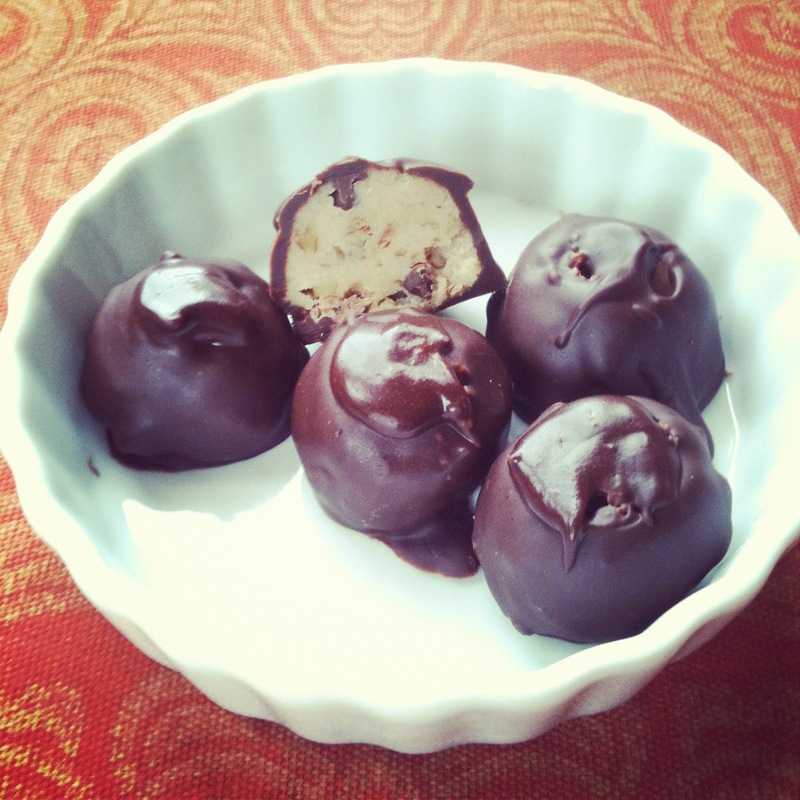 I’d never made truffles before, and thought I should try. Well, dipping truffles is no easy task, I learned. I perfected my technique as I went along, finding out the best way was leave a little opening at the top of the truffle so I could push it off the fork, and then fill in that hole immediately (before the chocolate started to dry) with a dab of chocolate from a spoon. Time intensive for sure, but worth it. Yum. 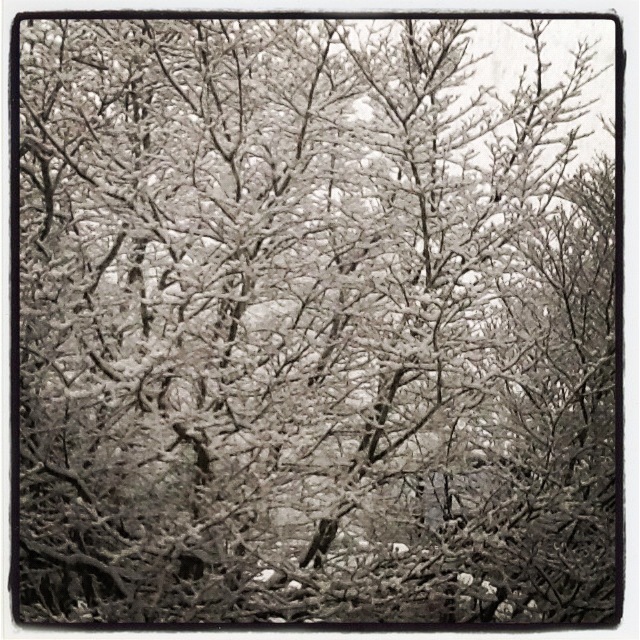 I’m sure you’ve heard: it’s snowing in Seattle. Has been all week. It’s kind of a big event around here. It’s chilly out. It’s wet. It’s quiet. It’s the kind of day that makes me want to bake. After venturing out for a walk in the snow, I needed a cookie. And not just any cookie. I needed a good cookie. 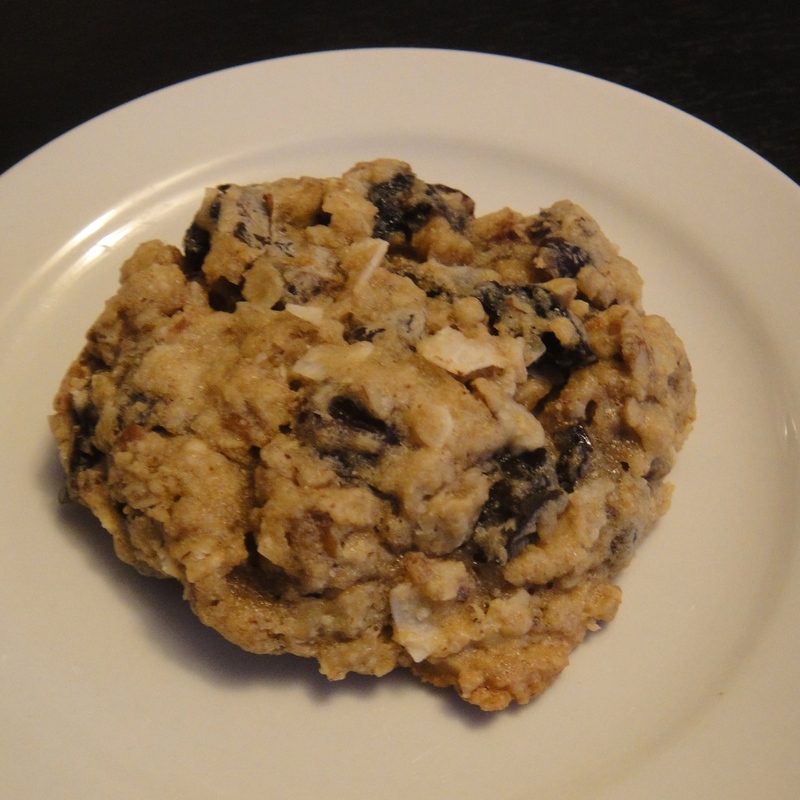 A somewhat healthy but totally tastey cookie. Thankfully, I had the perfect recipe in mind. I’ve adapted this over the years from one of Dorie Greenspan’s recipes. The result is what I consider to be the absolute perfect cookie. Good any day really, but especially on a snow day. 4T unsalted butter at room temp. I’m sure I’m just one of a million people who is saying to themselves, “Hey, it’s a new year. I should blog more.” However, I’m not sure the lull in my blogging had much to do with the specific dates. Mostly, I haven’t written much because November and December of last year got a bit hectic. There was a lot going on in our lives…several trips, dramatic changes to the daily routine, and as a result, not much cooking. 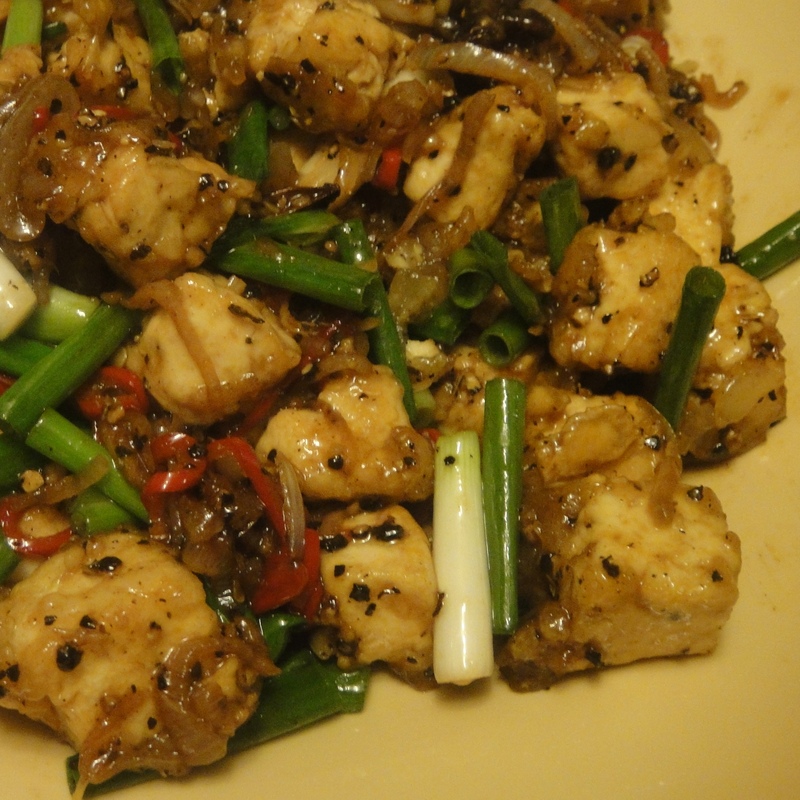 Ottolenghi’s Black Pepper Tofu. After a trip to Uwajimaya to stock my Asian pantry, I made this relatively straightforward tofu recipe. The pepper was intense, but in a good way. Incredibly rich and flavorful, this dish is fancy enough to shine as a weekend meal for sure. Serious Biscuit. Before they changed their name from Dahlia Workshop, we made our way down to South Lake Union on a sunny weekend morning to try Tom Douglas’s latest breakfast joint. The breakfast sandwiches finally filled the void in my life that has been vacant since we left the driving radius of Middlebury’s Bagel Deli. 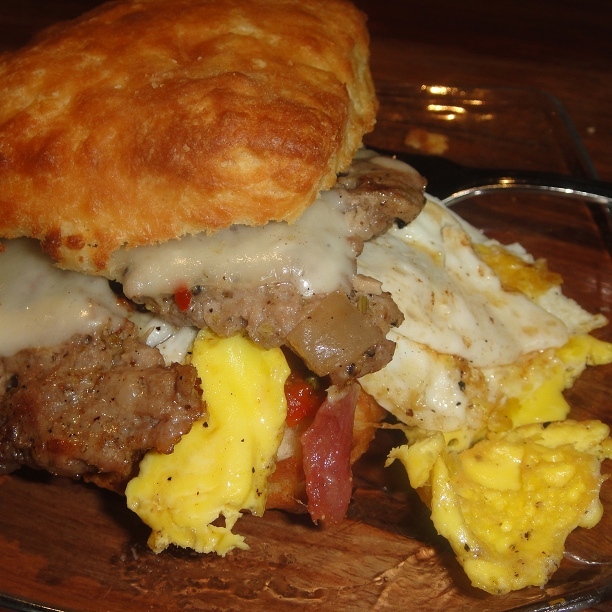 The biscuit is of course a much different medium than the bagel, but the enjoyment factor was in the same ballpark. I’d recommend steering clear of the “holy cow i feel ill”-inducing options such as fried chicken with tabasco black pepper gravy, and instead going with something more simple, like the fennel sausage and egg with pepper relish and fontina. But then again, who am I to say what your weekend morning might call for. Pecan Pie. This Thanksgiving, for the first time, I added a third slice of pie to my already crowded dessert plate: chocolate pecan. I couldn’t believe what I’d been missing for so long! And then, at a delightful holiday party around Christmas, the hosts served me my second pecan pie. It totally hit the spot again. Although I have to say I would have switched the pies if possible. I think a delicate, slightly sweet pecan pie is great alongside pumpkin and apple, whereas the chocolate pecan stands out solo. My friend Leigh shared a recipe for the latter which I can’t wait to have the occasion to bake. Delancey. When I turned 28 in November, I was lucky enough to gather ten of my closest friends for a dinner at Seattle’s best artisan pizza joint. The best part about having a party of 11? Making a reservation! They only take reservations for parties of 6+, and without one the wait is still usually 2 hours, even years after their opening. We kept the ordering simple: one of each pizza on the menu. The crimini was my favorite as always, but everything was sensational. I love that place. Orangette was even in the house – I decided to pretend she knew it was my birthday and was nearby to celebrate. Yeah right. Euclid Hall. On an early December trip to Denver, we wanted to try some of the region’s famous microbrews. And of course one can’t just drink a high-quality beer solo. Delicious gastropub fare alongside is often our requirement. Thankfully, a quick internet led us to Euclid Hall, ranked by Esquire magazine as having one of the top ten beer menus in the country. The beer list was indeed impressive: great selections on tap, and a bottle list organized by increasing complexity by mathematic terms. The food didn’t disappoint either. 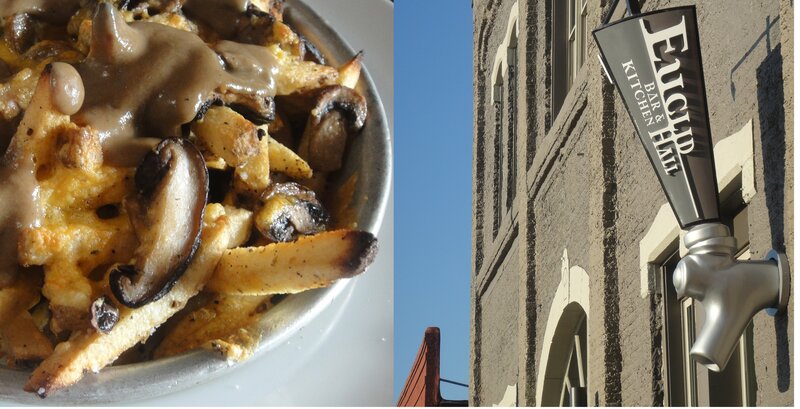 We had wild mushroom poutine with porcini gravy and Wisconsin cheddar curds, a double decker chicken schnitzel sandwich on dill rye with aioli and apple cabbage caraway slaw, and some “hot, spicy and very sincere pickles” on the side. Based on this restaurant and our lunch at Masterpiece Delicatessen, I was quite encouraged by Denver’s food scene.